Sometimes the D-FW Nielsen ratings are just plain -- uneventful. As they were from Thursday through Sunday, when the most-watched prime-time attraction was a rerun of CBS’ Blue Bloods. Friday’s 9 p.m. reprise drew 218,133 viewers while NBC’s two-hour edition of Dateline, airing on the same night, had Thursday through Sunday’s biggest haul of advertiser-coveted 18-to-49-year-olds with 96,213. If your pulse is racing, then you need to cut your fingernails for some real excitement. So let’s not tarry and just go to the local news derby results, with the start of the May “sweeps” ratings period looming on Thursday, April 27th. Thursday -- TEGNA8 took the 10 p.m. trophy in total viewers while NBC5 ran first with 25-to-54-year-olds (main advertiser target audience for news programming). Fox4 had twin wins at 6 a.m. and the Peacock did likewise at 5 p.m. The 6 p.m. firsts went to TEGNA8 in total viewers and Fox4 among 25-to-54-year-olds. Friday -- Fox4 ran the table at 10 p.m. while NBC5 swept the 6 a.m. competitions. The early evening hours brought two more sweeps, with TEGNA8 taking both 6 p.m. firsts and NBC5 controlling the 5 p.m. races. CBS’ two-hour edition of Survivor had prime-time’s biggest haul of D-FW viewers Wednesday while Fox4’s 9 p.m. local newscast ranked No. 1 with advertiser-prized 18-to-49-year-olds. It otherwise was a night when NBC went with wall-to-wall repeats, Fox aired an Empire rerun and ABC regurgitated four sitcoms before offering a new episode of Designated Survivor. Survivor had 181,778 total viewers in winning from 7 to 9 p.m. in the Big Four broadcast network universe. But Fox’s competing combo of a new Shots Fired and the Empire reprise took those hours among 18-to-49-year-olds with respective scores of 44,899 and 38,485 viewers. At 9 p.m., Fox4’s news won in both measurements, with 167,235 total viewers and a commanding 70,556 in the 18-to-49 age range. In comparison, Designated Survivor drew just 16,036 viewers in the 18-to-49 realm, which doesn’t bode at all well for its future. FX filled its 9 p.m. slot with the Season 3 premiere of Fargo, which made a minimal impression with 36,356 total viewers and a measly 6,414 within the 18-to-49 motherlode. The audience will grow via DVR and On Demand views, but that’s still a very slow start in D-FW at least. TEGNA8 prospered with a pair of 10 p.m. wins in total viewers and 25-to-54-year-olds (main advertiser target audience for news programming). Fox4 ran the table at 6 a.m. and did likewise at 5 p.m. NBC5 salvaged its day with a sweep of the 6 p.m. competitions. CBS’ NCIS again led the way in total D-FW viewers Tuesday night, with the network’s Bull a close second. The Mark Harmon-led crime buster drew 349,013 viewers before Bull won the 8 p.m. hour with 341,742. CBS’ NCIS: New Orleans then stayed strong with an easy 9 p.m. win in total viewers (305,386). As usual, the tables were turned with advertiser-coveted 18-to-49-year-olds. NBC’s 7 to 9 p.m. edition of The Voice dominated those two hours with 102,627 viewers in this key demographic before Fox4’s local newscast prevailed at 9 p.m. (57,728 viewers). It was another lean night for ABC, particularly at 9 p.m., where Marvel’s Agents of S.H.I.E.L.D. ran a near-comatose fourth in the Big Four broadcast network universe with 36,356 total viewers and 19,243 in the 18-to-49-year-old realm. CBS11 capitalized on the strong lead in from NCIS: New Orleans to win at 10 p.m. in total viewers. But the station again fell to fourth with 25-to-54-year-olds (main advertiser target audience for news programming). Fox4 took the top spot. The 6 a.m. golds also went to Fox4 while NBC5 swept the 5 p.m. competitions. The two stations split the spoils at 6 p.m., with NBC5 drawing the most total viewers and Fox4 winning with 25-to-54-year-olds. NBC5 came within a sliver Monday of pulling off an exceedingly rare double grand slam with its four principal local newscasts. The station swept the 5, 6 and 10 p.m. D-FW Nielsens in both total viewers and 25-to-54-year-olds (main advertiser target audience for news programming) while adding a 6 a.m. win in that key 25-to-54 demographic. In total viewers, though, NBC5 and Fox4 tied for first place at 6 a.m. Or if you break it down to another decimal, Fox4 broke what’s generally charted as a rounded-off tie by drawing 69,803 viewers to NBC5’s 69,075. The prime-time golds again went to the Peacock’s two-hour edition of The Voice, which paced all programming in both total viewers (356,284) and 18-to-49-year-olds (137,905), the preferred advertiser audience for entertainment programming. NBC’s Taken then won the 9 p.m. hour in total viewers (189,049) and 18-to-49-year-olds (70,556). CBS’ two-hour tribute to The Bee Gees and ABC’s annual reprise of The Ten Commandments hopped to it in the weekend D-FW Nielsen ratings. On Sunday from 7 to 9 p.m., Stayin’ Alive: A Grammy Salute to the Music of the Bee Gees led all TV attractions with 218,133 viewers. And The Ten Commandments ruled Saturday night’s prime-time numbers with an average of 109,067 viewers during the course of more than four-and-a-half-hours. NBC’s Saturday Night Live, which began opposite the big late night finish for Commandments, was the top overall draw, though. It pulled in 174,506 viewers. Both the Bee Gees and Commandments slumped badly with advertiser-prized 18-to-49-year-olds, some of whom likely have never heard of either. The Bee Gees drooped to 41,692 viewers in this key demographic, edging NBC’s Little Big Shots for first place in the 7 p.m. hour but losing to the Peacock’s Chicago Justice from 8 to 9 p.m. Sunday’s biggest overall draw among 18-to-49-year-olds, Fox4’s 9 p.m. local newscast, had 51,314 viewers within the Big Four broadcast network universe. In the overall TV realm, cable’s TNT ranked as the 18-to-49 king with its Sunday night matchup between the Houston Rockets and Oklahoma City Thunder. Commandments fell completely asunder with 18-to-49-year-olds, averaging just 9,621 of ‘em. That’s less than one-tenth of its total viewers audience, making the C.B. DeMille epic one of the older-skewing TV programs of modern times. Moving on to Friday night, where CBS’ Blue Bloods topped the prime-time parade in total viewers with 225,404 while ABC’s Shark Tank led among 18-to-49-year-olds (48,107). TEGNA8 had the most total viewers at 10 p.m. and Fox4 ran first with 25-to-54-year-olds (main advertiser target audience for news programming). Fox4 also was tops at 6 a.m. in total viewers but TEGNA8 enjoyed a rare win with 25-to-54-year-olds. NBC5 swept the 6 p.m. competitions and Fox4 did likewise at 5 p.m.
CBS’ The Big Bang Theory, Fox’s Empire and CBS’ NCIS (a rerun no less) were the overall top ratings scorers during the past three weekdays while NBC’s The Voice and ABC’s Grey’s Anatomy also performed solidly. Sound familiar? On Thursday, Big Bang as usual batted lead-off and pulled in 341,742 D-FW viewers while also ranking as prime-time’s top attraction with advertiser-craved 18-to-49-year-olds (118,663). The venerable Grey’s then held steady, with its 7:30 to 8 p.m. portion winning in both ratings measurements before ABC’s Scandal and The Catch both dropped off considerably. Fox’s 8 p.m. hour of Empire was Wednesday night’s top draw in both total viewers (261,760) and 18-to-49-year-olds (102,627). Another CBS perennial, Survivor, ranked as the prime-time runner-up in both realms. On TXA21, the Dallas Mavericks closed out their 33-49 season with two more ratings thuds, drawing just 29,084 total viewers and 12,828 in the 18-to-49 age range. Tuesday’s 7 p.m. repeat of NCIS had the night’s biggest haul of total viewers with 218,133 while NBC’s competing episode of The Voice was prime-time’s top performer among 18-to-49-year-olds (60,935). The Mavs fared much better with their heavily publicized stunt-casting sendoff for Tony Romo, who suited up and participated in warmups but did not play despite many in-house fans urging otherwise. Also on TXA21, the home loss to Denver averaged 65,440 total viewers and a heady 41,692 in the 18-to-49 demographic. Here are the Tuesday-Thursday local news derby results, with the four-week May “sweeps” ratings period starting soon on April 27th. Tuesday -- After another lengthy drought, CBS11 broke through with a 10 p.m. win in total viewers while Fox4 had the most 25-to-54-year-olds (main advertiser target audience for news programming). Fox4 swept the 6 a.m. races and TEGNA8 did likewise at 6 p.m. The 5 p.m. spoils went to NBC5 in total viewers and Fox4 with 25-to-54-year-olds. Wednesday -- TEGNA8 won in total viewers at 10 p.m. and Fox4 ran first among 25-to-54-year-olds. Fox4 and NBC5 tied for the most total viewers at 6 a.m., but the Peacock won outright with 25-to-54-year-olds. The two stations also were fit to be tied in total viewers at 5 p.m., but this time Fox4 had the 25-to-54 win to itself. At 6 p.m., NBC5 won in total viewers and shared the 25-to-54 spoils with Fox4. Thursday -- Let’s make it easier on unclebarky.com with sweeps at 5 and 6 p.m. (NBC5) and at 6 a.m. (Fox4). Loyalties were divided at 10 p.m., where TEGNA8 won in total viewers and NBC5 with 25-to-54-year-olds. At age 58, Steve Stoler is happily free and clear -- of cancer for the past 20 years and from a TV news room since December 2013. In short he’s decompressed. Exhaled. Untied the knots in his stomach. But it’s not quite out of his system. A 34-year career in local TV news, beginning at Macon, GA’s little WCWB-TV, left him with a wealth of experiences and the itch to share some of them. By Stoler’s count, he did roughly 9,000 stories for six TV stations. His new self-published paperback book, Tonight At Ten, starts from the very beginning. It’s an easily digested, quick 115-page read. And if you’d like a copy, for $14.95, it’s available via stevestoler.com. Stoler also would be happy to speak at your event and then sign and sell copies. Whatever it takes. We talk about it at the White Rock Lake coffee shop and via a subsequent brief email exchange. Stoler comes off as one of the nicest people you’ll ever meet, and probably is. This is a good trait when you’re the City of Plano’s Director of Media relations, where his principal tasks are to deal with reporters and spread positive stories, whenever possible, about the community he’s called home for 20 years with his wife, Susan, and sons Jordan and Jake. 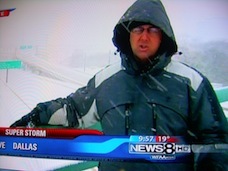 Stoler also covered Plano for most of his tenure at TEGNA8. So he thoroughly knows the ins and outs. It also was a time before self-publishing took hold. So Stoler shelved the idea but continued to keep meticulous “calendars” of his various adventures in reporting. Shortly after leaving TEGNA8, he revisited the idea. Dallas-based Brown Books Publishing Group wanted $25,000 upfront, a deal that included 3,000 books, Stoler says. “Most new authors sell maybe 10 books to friends and family. And then you’ve got 2,900 that are sitting in storage,” he says. So that didn’t seem like a wise financial move for a budding author who in large part sees Tonight At Ten as “more of a bucket list thing” and also a validation of his career for both his children and any eventual grandchildren. The book includes blurbs from three of Stoler’s former TEGNA8 colleagues -- Dale Hansen, Byron Harris and Janet St. James -- plus a foreword from the station’s retired longtime anchor, Gloria Campos. “You just might discover and learn to appreciate what makes a great reporter -- a good person and a compassionate human being,” Campos writes in part. 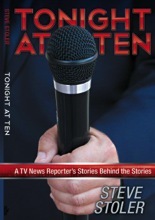 Dog Ear’s back cover promotion says that Stoler also “takes the gloves off” in talking about some of the downsides of his TV news profession. But Tonight At Ten in reality is no slugfest. Stoler takes some issue with the direction of TV news and its increasing reliance on “social media” content and budget-friendly VJs (video journalists) who shoot, write, edit and transmit their stories at the expense of behind-the-scenes news room personnel whose jobs have been downsized out of existence. 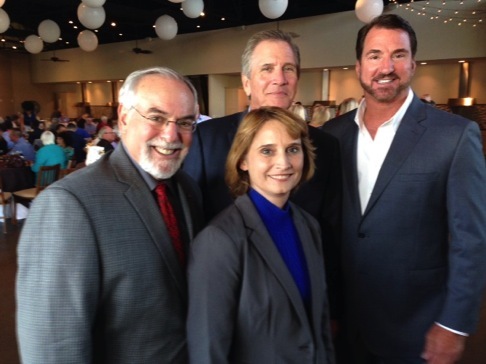 He additionally writes bluntly about a pointed and dispiriting encounter with ex-Fox4 news director Maria Barrs, who left the station in August 2011 to become president and general manager of a Sacramento, CA television station and since has retired from the news business. You’ll have to read the book, but things didn’t go well either before or immediately after Stoler heard that he wasn’t considered one of Fox4’s “go-to reporters.” But this particular chapter, “Maria and the Mi-Ti-Fine Massacre,” is atypical. Back during the “deep pockets” days of local TV news, Stoler was sent by Fox4 to cover the 1989 San Francisco earthquake. Rival D-FW stations also dispatched reporters in the interests of establishing a “local presence.” Commonplace then, it’s basically out of the question now. Stoler also remembers the nickel-and-dime days. In a chapter titled “We Can’t; We’re Broke,” he vividly recounts his first day in TV news at Macon’s WCWB. WCWB had a six-person news room at the time. All these years later, major market TV stations seem to be inching toward rather than away from such staffing levels while also hiring on the cheap. 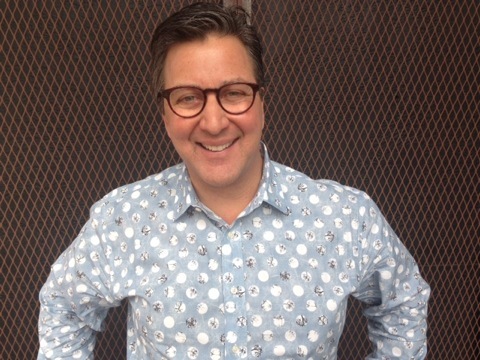 If Stoler was starting out in 2017 rather than the late 1970s, he might have been able to trampoline directly from WCWB to a Dallas TV news room. “A lot of people being hired in a major market today are just a couple of years and one job removed from college,” he says. “I never imagined the day would come when we’d see that. By 2013, Stoler found himself in something of a middle-aged crisis. He assumed that TEGNA8 would re-up him for another two years after his contract expired in December. But at the same time, “all these reporters at Channel 8 started getting these amazing opportunities,” he says. “Channel 8 reporters seemed to be a really valuable commodity,” with Craig Civale, Brad Hawkins, Brad Watson, Chris Hawes and Cynthia Vega among those segueing to public relations jobs with better hours and less built-in stress. Stoler hired a “career coach” and interviewed for positions at Atmos Energy and with the city of McKinney before learning that Plano was looking for someone who could talk up the city’s attributes while also serving as a media liaison. Hmm. The “daily grind” is now more about having that first cup of morning coffee. The gut grind of “coming up with a story idea every day” for a ratings-driven news boss is now more than three years in Stoler’s rear view mirror. For 34 years, though, he pretty much had a blast. Even those on-air contests during WCWB (Channel 41) newscasts -- Stoler once gave away a pair of dentures as the station’s news anchor -- are now the stuff of misty, water-colored memories suitable for Tonight At Ten. NBC’s The Voice powered itself to another dominating win over ABC’s Dancing with the Stars Monday while also outdrawing all other prime-time attractions. In its usual 7 to 9 p.m. slot, The Voice drew 305,3865 D-FW viewers to 203,591 for DWTS. Among advertiser-coveted 18-to-49-year-olds, The Voice crushed DWTS by a score of 105,834 viewers to 32,071. DWTS also was beaten in that key demographic by three of CBS’ four competing sitcoms -- Kevin Can Wait, Superior Donuts and 2 Broke Girls. Only Man With A Plan failed in that endeavor. At 9 p.m., Fox4’s local newscast tied CBS’ Scorpion in total viewers with 174,506 apiece. But the news won outright with 18-to-49-year-olds (60,935). On AMC, the 9 p.m. Season 3 premiere of Better Call Saul had 65,440 total viewers. Well over half of them -- 48,107 -- were within the 18-to-49 sweet spot. So that’s a considerable plus. NBC5 ran first in total viewers at 10 p.m. while TEGNA8 won among 25-to-54-year-olds (main advertiser target audience for news programming). Fox4 swept the 6 a.m. races and NBC5 did likewise at both 5 and 6 p.m.
Didja miss me? Don’t answer that. But a long and winding road trip is now in the rear view mirror. So it’s time for a catchup round. Sunday’s final round of The Masters on CBS began as another prime opportunity for Dallasite Jordan Spieth to win his second green jacket. But in an echo of last spring’s collapse, he quickly played himself out of contention while Sergio Garcia at last conquered his nerves and won his first Major. Garcia dropped his winning birdie putt at precisely 6:30 p.m. on the first playoff hole to beat Justin Rose. That made it five-and-a-half hours of continuous drama after CBS began its coverage at 1 p.m. The Masters averaged 210,862 D-FW viewers during that period, with a peak audience of 327,200 for the closing 15 minutes. That’s dramatically down from 2016, when the final round of The Masters drew 325,790 total viewers with a high point of 460,356. But Spieth remained in contention throughout after blowing a 5-shot lead going into the final nine holes. That obviously made a big difference in terms of local audience interest. Saturday’s third round of The Masters, which ended with Spieth just two shots behind the leader, averaged 130,880 total viewers. This again was a deep dip from last year’s penultimate round (an average of 240,802 viewers). Friday’s prime-time programming was paced by CBS’ 8 p.m. episode of Hawaii Five-0 in total viewers (196,320) while NBC’s 8 to 10 p.m. edition of Dateline led among advertiser-prized 18-to-49-year-olds with 70,556. The Dallas Mavericks and San Antonio Spurs, playing on TXA21 with a parade of reserves, epitomized the Mavs’ pitiful season with an average of 14,542 total viewers, including 9,621 in the 18-to-49 age range. Thursday’s runaway prime-time leader, CBS’ The Big Bang Theory, drew 349,013 total viewers and 115,456 within the 18-to-49 motherlode. On Wednesday night, Fox’s Empire cleaned up with 254,489 total viewers 102,627 in the 18-to-49 realm. Both were prime-time’s best showings. Moving on to Tuesday, where CBS swept prime-time in total viewers with its regular lineup of NCIS (349,013), Bull (276,301) and NCIS: New Orleans (181,778). NBC’s The Voice ranked as the top overall draw with 18-to-49-year-olds (70,556) before Fox’s Prison Break and Fox4’s local newscast took over from 8 to 10 p.m. with respective totals of 51,314 and 44,899 viewers. CBS reigned on Monday night with North Carolina’s win over Gonzaga in the NCAA basketball tournament championship game. It averaged 385,368 total viewers and 157,148 within the 18-to-49-year-old sweet spot. Finally, here are the Monday through Friday local news derby results. Monday -- NBC5 swept a downsized three-way race at 10 p.m. in both total viewers and 25-to-54-year-olds (main advertiser target audience for news programming). Fox4 had twin wins at 6 a.m. and 5 p.m. while TEGNA8 ran the table at 6 p.m.
Tuesday -- NBC5 won in total viewers at 10 p.m., but Fox4 drew the most 25-to-54-year-olds. Fox4 again swept the 6 a.m. competitions while the 6 p.m. golds were split between NBC5 in total viewers and TEGNA8 among 25-to-54-year-olds. Fox4 and TEGNA8 tied for the top spot at 5 p.m. in total viewers; NBC5 had first place to itself with 25-to-54-year-olds. Wednesday -- The Peacock and TEGNA8 shared first place at 10 p.m. in total viewers while Fox4 won among 25-to-54-year-olds. Fox4 continued to enjoy itself at 6 a.m. with another sweep. And NBC5 dominated the early evening hours by running the table at both 5 and 6 p.m.
Thursday -- TEGNA8 won at 10 p.m. in total viewers and Fox4 drew the most 25-to-54-year-olds. Fox4 again swept the 6 a.m. competitions while NBC5 did likewise at 5 p.m. NBC5 also had the most total viewers at 6 p.m. and shared the top spot with Fox4 among 25-to-54-year-olds. Of note: TEGNA8 registered “hashmarks” (no measurable audience) at 5 p.m. in the 25-to-54-year-old demographic. Which perhaps prompted a few spit takes. Friday -- NBC5 swept the 10 p.m. competitions and also had twin wins at 6 p.m.
Fox4 won in total viewers at 6 a.m. but was beaten by a hair among 25-to-54-year-olds by NBC5. The two stations also battled at 5 p.m., with NBC5 tops in total viewers and Fox4 winning with 25-to-54-year-olds. All of this left nothing to show for CBS11, which was shut out in 40 competitions for the No. 1 spots at 6 a.m. and at 5, 6 and 10 p.m. With the May “sweeps” ratings period looming, the station has miles to go across the board.